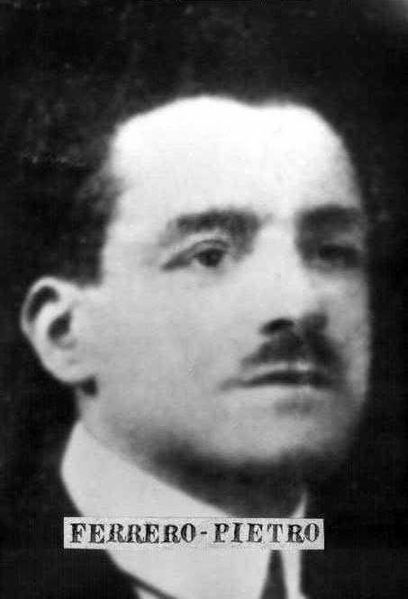 A short biography of Pietro Ferrero who, with Maurizio Garino, was one of the anarchists at the head of the factory councils movement in Turin. Pietro Ferrero was born at Grugliasco in Turin on 12th May 1892. In 1910 he was among the first members of the Centro di Studi Sociali della Milano,a working class quarter of Turin, which transformed itself into a Modern School along the principles developed by the Spanish libertarian Francisco Ferrer and he became its secretary in 1911, alongside its director Maurizio Garino. The school was to have an important political and cultural influence on many Turin workers. In 1918 he began working in the Fiat factories. During World War One, Pietro was active against the reformist leadership in the FIOM union with his friend and comrade Garino. In 1917, with the anarchists of the Milano quarter he participated in the movement in Turin against the bosses and the war. In 1919 he was elected secretary of the Turin FIOM. He was involved in much workplace agitation and many strikes, including those of April 1920 against the unilateral decision of Fiat to bring in legal summer time in the factories, and in the factory occupations. In Luglio where the first occupation took place, he chaired an assembly of the internal commission of the factory councils which stated that the Turin masses were ready for anything and called on the FIOM to join with the anarcho-syndicalist USI in the revolutionary struggle. He was among the most active and intransigent militants during the factory occupations and he was totally opposed to the reformist D’Aragona-Giolitti agreement which led to the end of the occupations. As anarchist Errico Malatesta prophecied, the defeat of the movement would lead to the counter-revolution. This duly came in the form of fascism and Pietro was to pay with his life for the defeat that he had tried so hard to avoid. He was brutally murdered by the fascist squads led by Brandimarte (this thug was reintegrated into the Italian Army after World War Two and received full military honours) on 18 December 1922, after dreadful beatings. His body was dragged behind a truck, and he was dumped still living at the foot of the statue of Vittorio Emanuele, where he was finished off. Twenty-one other workers were murdered in this fascist attack on the Turin working class. The fascist intimidation meant that, as Garino testified, only 15 people attended the funeral of Pietro, who had organised 20,000 workers in the FIOM. Gwyn Williams dedicated Proletarian Order, his book on the factory occupations, to Pietro in 1975.